Compared to the base Impreza, the WRX has a turbo-charged drivetrain, wider low-profile tires, larger brakes, and firmer, higher-quality suspension components. Both front and rear brake rotors were ventilated disks. The vehicle had a curb weight of 1,220 kg (2,690 lb). The center differential was a viscous coupling type. The rear LSD was a viscous type. The turbocharged flat-4 2.0L (then later a 2.5L), Subaru Boxer engine with 240 PS (176.5 kW; 236.7 hp) at 6000 rpm with 31 kg·m (300 N·m; 220 lb·ft) at 5000 rpm. In October, 1993, Subaru introduced the 1994MY WRX which produced 240 PS (176.5 kW; 236.7 hp) at 6500 rpm with 28.5 kg·m (279 N·m; 206 lb·ft) at 5000 rpm. The vehicle gained 30 kg (66 lb) to a total curb weight of 1,250 kg (2,756 lb). October 1993 was also the start of production of the wagon version, with 220 PS (162 kW; 217 hp). Built May 1993 until Sep 1994 (GF8-B only) came as auto and manual. with or without air-con on both models. the engine and ECU was the same as the normal WRX wagon (manual or auto models) had colour coded mirrors, but black door handles came in colours. In November 1994, the WRX had a power increase to 260 PS (191.2 kW; 256.4 hp) at 6500 rpm with 31.5 kg·m (309 N·m; 228 lb·ft) at 5000 rpm. The wheel diameters were increased to 16 inches (410 mm) and brake rotors were both changed to ventilated disks. With curb weight decreased to 1,230 kg (2,712 lb). 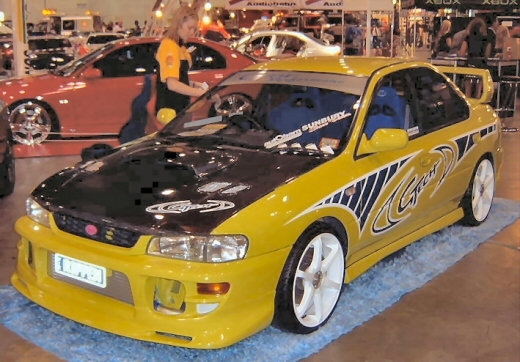 The 1996 WRX debuted on January 1996. The WRX design received minimal mechanical changes, but a WRX V-Limited Edition was introduced to celebrate the success of the Impreza WRC car in the FIA WRC. It was mechanically the same as the WRX. The V-limited cars are painted in World Rally Blue.